Endolimax nana is a small nonpathogenic intestinal amoeba. The cyst (shown at right) is round to oval, measuring 6-8 µm, and is often seen with four nuclei. 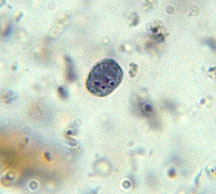 The Trophozoites measure 8-10 µm and are almost indistinguishable from Iodoamoeba butschlii.